Just like my own Jewish family, White House senior advisor Steven Miller’s family was the beneficiary of immigration policies that his own administration is working so hard to undo. Trump may be unhinged but Steven Miller is clearly unmoored, especially when it comes to his own family roots. Like many Jewish Americans, Steven Miller is from a family of immigrants and refugees who desperately came to this country escaping anti Jewish pograms. But unlike most Jewish Americans who feel a deep sense of obligation to help the next generation of refugees, Steven Miller is Trump’s architect of his draconian immigration policy. Miller is a disgrace to America and a disgrace to the Jews. 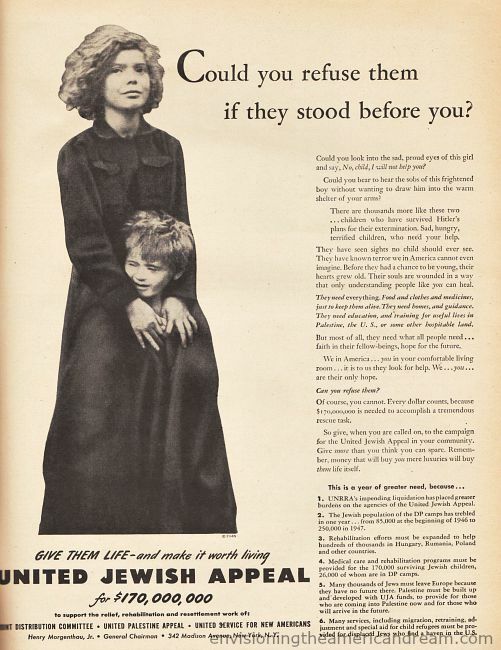 Jews and Jewish organizations have longed stepped up, no more so than after WWII when the displaced, homeless Jews of Europe faced another crisis in their bitter struggle to survive. I feel proud that my own family stepped up and opened their hearts in compassion when it was called for.. In the late 1940’s anti-semitism was a prevalent attitude in the US. In Congress, antisemitism was an explaining factor in the common hostility towards refugee immigration and anti-semitism explains Congress’s action that blocked all likely havens of refugee for the Jews before the War and were slow to change. Part of that hostility was fueled – as some grievances are now- by stereotypes of the refugees as harbingers of a dangerous ideology, in this case communism. 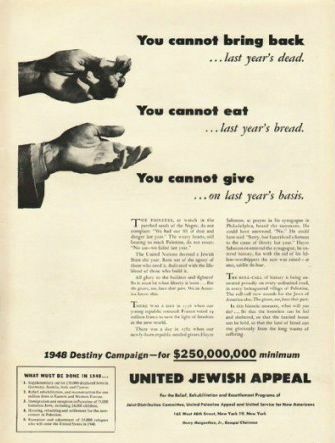 While Congress cooled their heels, charitable organizations stepped up, none more so than the United Jewish Appeal. The UJA appeal was unprecedented. The United Nations Relief and Rehabilitation Administration that had started helping Diplaced persons in 1945 was saddled with limited resources and inadequate to cope with the tremendous need. 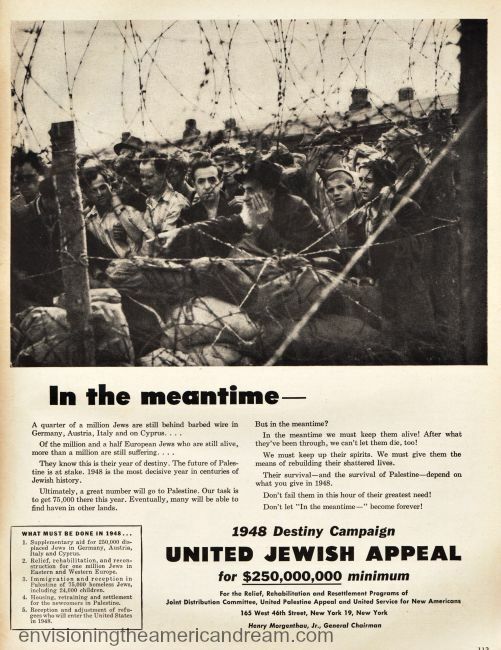 A major campaign by the United Jewish Appeal organized in 1946 to help the Jewish Displaced Persons set in motion the most massive reconstruction and immigration program in Jewish history. It was a challenge to American Jews to help survivors. Along with thousands of others who answered the humanitarian call, my own family opened their hearts in compassion to help, never knowing that in decades to come this saga would touch their own family. Winter 1946. (L) While my mothers Manhattan family vacationed in Miami Beach , (R) my husband and his family spent the winter in a DP Camp in Germany. On a snowy February afternoon in 1946 while my future in-laws scrounged for food in a Displaced Persons camp in Germany, bartering cigarettes and chocolate for fresh meat and milk my own beloved grandmother Sadie sat in the warm comfort of the grand ballroom of the Waldorf Astoria Hotel, one of a several hundred women attending the opening rally of The Woman’s Division of the UJA, the United Jewish Appeal of Greater NY. Seated at snowy white linen covered tables festooned with silver plated urns filled with Herbert Tareyton cigarettes, they waited silently, somberly sipping tea and nibbling lighter than air angel food cake in anticipation of the featured speaker Mrs Franklin Delano Roosevelt. These ladies had gathered together to embark on the greatest drive to raise money for the Jewish Refugees , part of The UJA’s recently launched $100,000,000 nation wide drive. Eleanor Roosevelt the guest speaker had just recently come from visiting 4 DP camps and movingly shared her experience of the indescribable pain and suffering she witnessed. These smartly dressed ladies in their Hattie Carnegie dresses who now lived in large limestone apartments that lined the grand Avenues of the Upper West Side of N.Y. gave her a standing ovation. Nearly all these women were once Eastern Europeans themselves, or had come from those who had made the odyssey, suffered from dislocation, confusion, fear, loss of what they knew. All looking for a better life. Many of these same women knew first hand the Cossack’s on horseback that had driven their people from their homes, the laws that had prevented them from owning land, living where they wanted, getting an education. They knew that even here, in this new land where they had prospered because prosperity was what America had to offer, they were still despised for being themselves, for being Jews. So they knew the only way to survive was with your people and to care for them. That it was the obligation of American Jews to contribute generously to relieve the suffering of the surviving Jews of Europe was never in question. 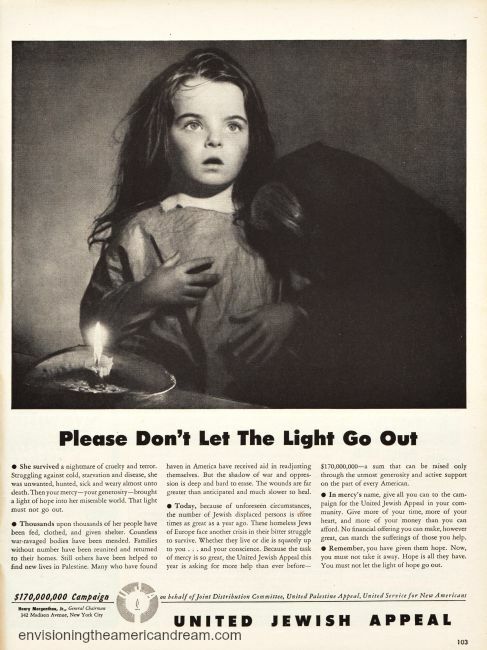 The UJA ran a series of emotion laden ads asking for help, such as the one above. These are your sister and brothers who speak. Praying that their liberation from Nazi tyranny shall not be turned into a mockery by the worlds indifference. Praying that now, after years of torture and death and a miserable existence in displaced persons camps they be helped to rebuild their lives. By 1947 the need was greater. The Jewish population of the DP camps has tripled in one year. From 85,000 at the beginning of 1946 to 250,00 in 1947. Not only were US Quotas still in place against the Jews there was an organized campaign against permitting the entrance of displaced persons into the U.S. with President Truman’s mail 7 to 1 against admission. Many nations shared the shame of the US in having refused sanctuary to stateless Jewish survivors following WWII. Efforts to get them into Palestine faced great odds. Great Britain continued to strictly limit the number of Jews allowed in Palestine. Jews already living in British-controlled Palestine organized “illegal” immigration by ship. In 1947 the British forced the ship Exodus 47 which was carrying 4,500 Holocaust survivors headed for Palestine, to return to Germany where the passengers were again imprisoned in camps. The United Nations Relief and Rehabilitation Administration set to expire that June placed greater burdens on the agencies of the UJA. 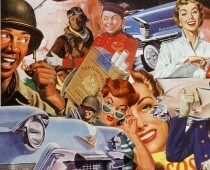 The massive campaign continued running ad campaigns in the popular magazines. Could You Refuse Them If They Stood Before You? “Could you look into the sad proud eyes of this girl and say, No child I will not help you? Could you bear to hear the sobs of this frightened boy without wanting to draw him into the warm shelter of your s arms? There are thousands more like these 2…children who have survived Hitlers plan for their extermination. Sad, hungry terrified children who need your help. They have seen sights no child should ever see. They have known terror we in America cannot even imagine. Before they had a chance to be young, their hearts grew old. Their souls are wounded in a way that only understanding people like you can heal. They need everything. Food clothes and medicine just to keep them alive. The need homes and guidance. They need education and training for useful lives in Palestine the US or some other hospitable land. But most of all they need what all people need…faith in their fellow beings, hope for the future. We in America…you in your comfortable living room..it is us they look for help. We…you…are their only hope. It was a moral obligation then, it is a moral obligation now. Another excellent missive from Envisioning the American Dream by Sally Edelstein concerning our responsibilities with regard to refugees and the utter hypocrisy of Donald Trump and key advisers (most notably Stephen Miller on this issue) in formulating a policy regarding how we as a nation treat people seeking refuge from a homeland which has torn their world asunder. Bereft of any humanitarian moral courage, the policy to this point has resulted in large scale separation of family members from each other with no thought of reuniting them, as well as denying valid applications for asylum and deportation back to their countries of origin despite the very real dangers posed to the lives of people thus turned away from our borders. The total lack of humanity and any semblance of compassion in dealing with this tragic situation illustrates how far from American values our government has come when led by a President and key adviser who have benefited mightily from more benevolent immigration policies from years gone by. The USA has not always been charitable when dealing with those who seek to come live within our borders, but this current attitude of xenophobia, racism and fear mongering is neither warranted nor a valid reflection of how a majority of the American people would seek to treat people living in such dire straits. Not only does this policy need to be called out for the morally bankrupt fiasco it has turned into, but Congress needs to stop sitting on its collective hands and pass legislation spelling out a better way to deal with immigration which not only deals with enabling people being persecuted and mistreated in their homelands (for whatever illegitimate reasons) to escape the dire circumstances that drove them to seek asylum here, but also to be treated with the compassion and dignity that should be afforded all people as their basic human right.